The cost for this online activity is $100. If you are a DMU faculty member or student, please contact the CME office at cme@dmu.edu for a coupon code. In 2013, the Department of Human Services reported 11,637 children in Iowa were the subject of abuse or neglect. 84% of adult (65+) abuse cases go unreported and 40% of all elder abuse involves some form of financial exploitation. This educational activity will describe various types of child and adult abuse and neglect, identify clinical findings that indicate abuse, and provide local resources of how and when to report. The curriculum will utilize current resources from the Iowa Administrative Code, Chapter 93, Mandatory Reporter Training Curricula, the Iowa Department of Human Services: Child Abuse: A Guide for Mandatory Reporters and/or Dependent Adult Abuse: A Guide for Mandatory Reporters, and meets the requirements of Iowa Code Section 135.11(26) in the identification and reporting of child and dependent adult abuse. Utilized approved curriculum #495 valid from October 28, 2017 – October 28, 2020. Identify when they need to make a mandatory report and who is a mandatory reporter. List the 11 categories of child abuse and the five categories of dependent adult abuse. Describe the required information needed, how to make a report, the timelines involved in reporting and possible consequences to not reporting. State the issues around confidentiality, how that applies to reporting and any immunity they have within the code. Recognize physical and behavioral signs of abuse. Gladys Noll Alvarez, LISW has worked at the Orchard Place Child Guidance Center since 1985 when she received her Master’s in Social Work from the University of Iowa. She began her career working with youth and families at risk in 1976 when she was a counselor with the Upward Bound program at Coe College. 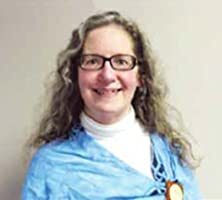 She has worked with victims of sexual abuse in individual, family and group therapy and is the co-founder of the Young Children’s Sexual Abuse Treatment Group at the Child Guidance Center. She is the recipient of the Al Shutlte Award in 2000, the Voices for Children Award in 2008 and the Michelle A. Moore Award in 2012. In her current role as the Trauma Informed Care Project Coordinator, Ms. Alvarez works to educate the larger system on the importance of changing the question from “What’s wrong with you?” to “What happened to you?”. She coordinates the work of the Trauma Informed Care Stakeholders group and provides in-service trainings to Orchard Place and the community while still maintaining an active case load of trauma clients. Relevant to the content of this educational activity, Ms. Alvarez has no financial relationships with commercial interest companies to disclose. MD: This activity has been planned and implemented in accordance with the accreditation requirements and policies of the Iowa Medical Society (IMS). Des Moines University (DMU) is accredited by the IMS to provide continuing medical education for physicians. DMU designates this enduring materials activity for 2.5 AMA PRA Category 1 Credit(s)™. Physicians should claim only the credit commensurate with the extent of their participation in the activity. DO: Des Moines University (DMU) is accredited by the American Osteopathic Association (AOA) to provide osteopathic continuing medical education for physicians. DMU designates this program for a maximum of 2.5 AOA Category 2-B credits and will report CME and specialty credits commensurate with the extent of the physician’s participation in this activity. Nurse: Des Moines University is Iowa Board of Nursing approved provider #112. This live activity has been reviewed and approved for 2.5 continuing education contact hour(s). No partial credit awarded. DPM: Des Moines University (DMU) is approved by the Council on Podiatric Medical Education as a provider of continuing education in podiatric medicine. DMU has approved this activity for a maximum of 2.5 continuing education contact hours. Other healthcare providers: This live activity is designated for 2.5 AMA PRA Category 1 Credit(s)™.